It was a bit of a last minute decision. Though we had talked about it for a bit before. In fact, even before we had kids, we had considered it. That was more than 8 years ago (the age of Scotty). Because it was last minute, we don't really have a plan. We didn't buy a curriculum. Just some cheap workbooks from WalMart and the like. And lots of reading from library books, of course. for the local school district. We've been going at it almost everyday for a few weeks. I quit one of my jobs that was making me crazy. A bit of a financial question left hanging. Teaching our oldest (Scotty) has been fun. Gracie a little less so, but she's growing on me. She learns quite differently from Scotty. I'm having to rethink things. Yes, I'm doing much of the teaching. 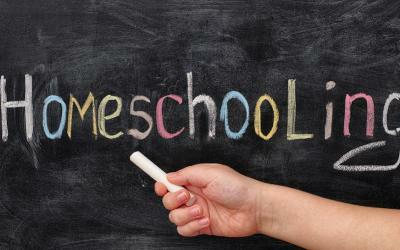 Not really the norm among homeschoolers. I've created worksheets and printed off ideas from others. A few days ago I created a crossword puzzle for Scotty. Clues and answers were based upon a book from the library. It was a little hard for him. Will need to dumb it down a bit for next time. Today I started working on some alphabet flashcards. Will use them with Gracie to build simple words. Perhaps play a Scrabble type game or two. I'm already enjoying the journey.